Made from local stone with high greenheart ceilings, and Barbados tiled floors, this exceptionally large Caribbean house offers the rare luxury of space, privacy and sensational views of the Pitons. The 640sqft master bedroom is furnished with a beautiful antique king size four-poster bed, a hand carved standing cheval mirror and private terrace. 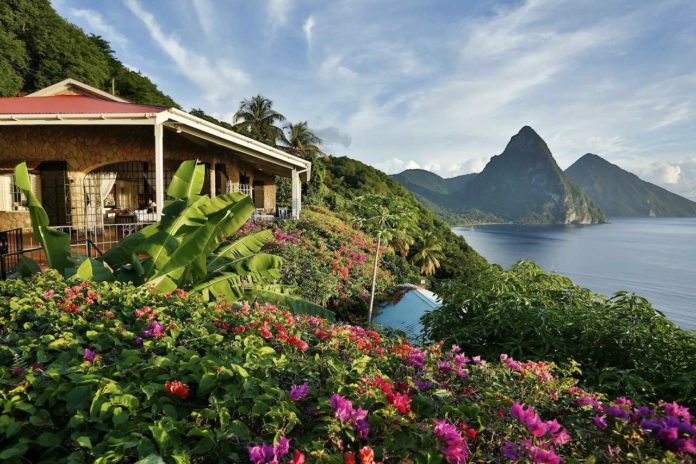 From the bed, the view of Piton is framed by bougainvillea climbing up the stone walls. The main house has three bedrooms and three bathrooms, while the separate cottage is the master bedroom suite with its own living room, kitchen, dressing area, marble bathroom, and terrace. Prices start from £3,145 per week. 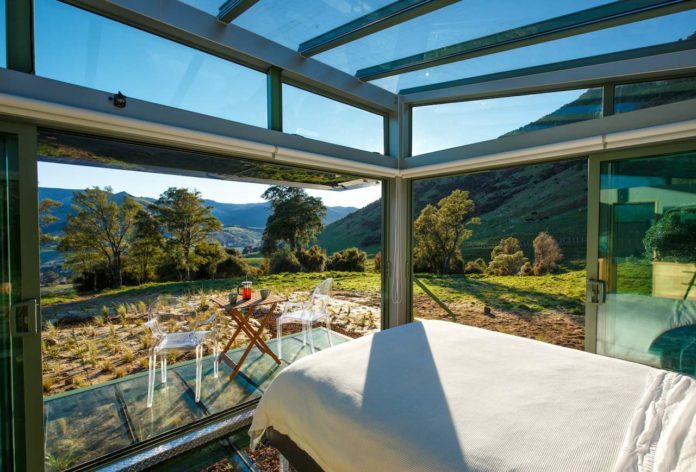 Made completely of glass from roof to floor, guests can sleep under the dazzling stars of the Southern Cross and awake to pure New Zealand native bush. With sliding glass doors for hot weather and bio-fuel fires for winter months, the Pure Pod offers unique year-round nature experiences. Reached only by a walk through the bush land into a completely private haven, the Pure Pod offers 360-degree views of the valley and the Pacific Ocean in the distance. There are three PurePods – one in Little River, Canterbury, and two in Kaikoura. From £210 per night based on two people sharing. Uma by COMO, Ubud, immerses guests in the culture of Bali. The Terrace Rooms are serene and magical, with French doors that open onto a private terrace overlooking the gardens, paddy fields and hills of the lush Indonesian island. 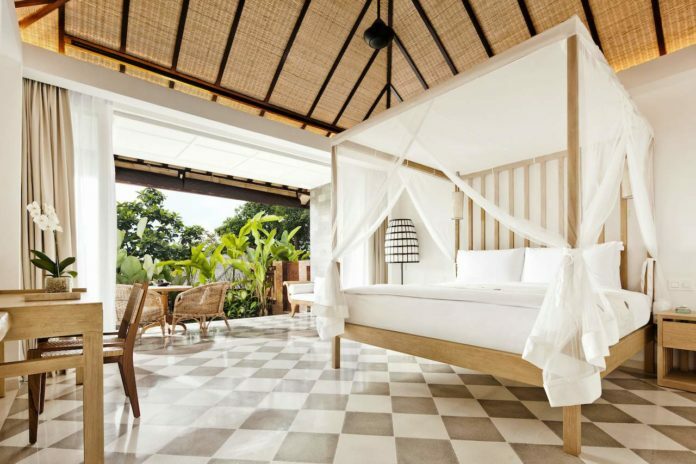 Carved wooden panels give the room the charm of a traditional Indonesian home, while the contemporary furnishings including a four-poster bed, sunken bath tub, outdoor shower and a private pool, make it the ultimate luxury jungle escape. Prices start from £191 per night based on two people sharing. Nestled in greenery, in the heart of Delhi’s diplomatic corridor, ITC Maurya is the city’s premier luxury hotel (President Obama, George W. Bush and Clinton have all stayed at the hotel). 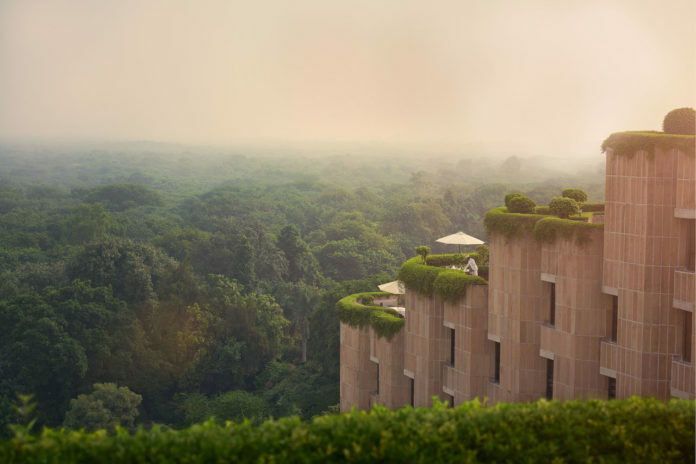 The Luxury Suite offers breathtaking views of Delhi’s green ridge, and blends grandeur and exemplary hospitality soaked in Indian traditions. The hotel is also home to Bukhara, one of the top 50 restaurants in the world, where guests can experience authentic North-West Indian cuisine in a traditional and rustic setting. Prices start from £254 per night based on two people sharing. Ever dreamed about lying in a super king sized custom made bed whilst watching the sun set or rise over the ocean? At Black Moon, that’s exactly what guests can do. 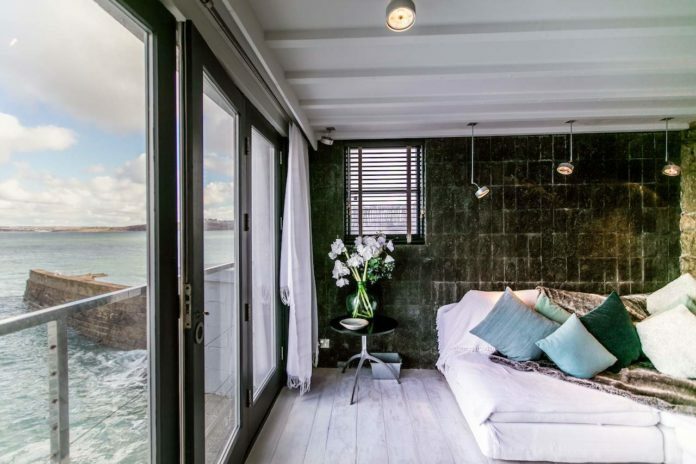 With the bedroom separated from the living room by a huge sliding mirrored wall, guests can enjoy truly spectacular coastal views towards Gwithian lighthouse. A striking one-bedroom property, Black Moon transforms the ubiquitous luxury cottage into a private hideaway. Prices start from £200 per night based on two people sharing. 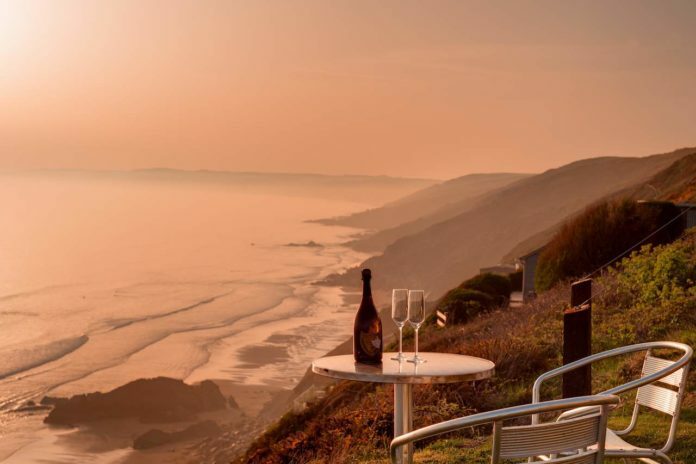 Perched at the top of Tregonhawke Cliff on the south coast of Cornwall, Laburnham is a secluded one-bedroom lodge that boasts 60 miles of uninterrupted panoramic sea views. Laburnham has an open plan living space, kitchen and dining area that opens up to the private clifftop garden, and a master bedroom that opens onto a decking area that overlooks the glistening sea. Stunning sea views and fresh sea air make this cosy British bolthole the ultimate Cliffside retreat. Blue Chip Holidays offers three nights at the Laburnham from £488 on a self-catering basis. 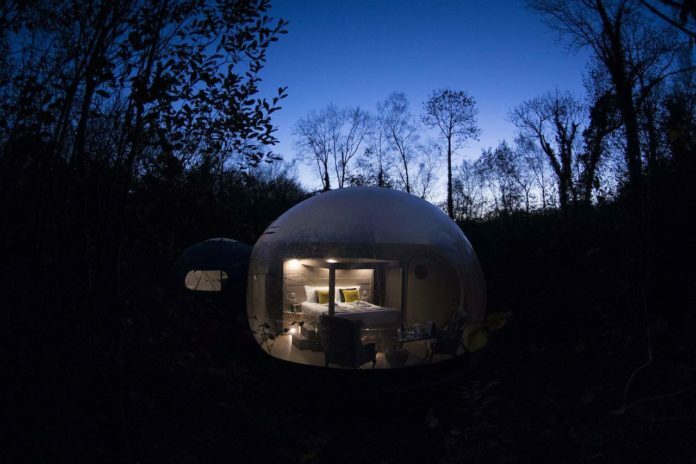 Set within the woods on the banks of Lough Erne, the bespoke Stargazing Forest Domes at Finn Lough Resort allow guests to escape the noise of the outside world and enjoy stargazing in solitude. The new forest domes feature 180-degree transparent walls and roof, and include luxurious creature comforts, such as a four-poster bed, waterfall shower, under floor heating, fluffy robe and slippers, and daily breakfast. Accessed by a short walk or drive through the forest or aboard a boat or pedal Hobie via Lough Erne, guests can immerse themselves in nature and watch the changes in the night sky around them. Prices start from £175 per night including breakfast, based on two people sharing. Overlooking the blue waters of the Mediterranean, fifty kilometers from Naples, Le Sirenuseis the most stunning and iconic hotel on the Amalfi coast (and discreetly plays host to A-list celebrities). 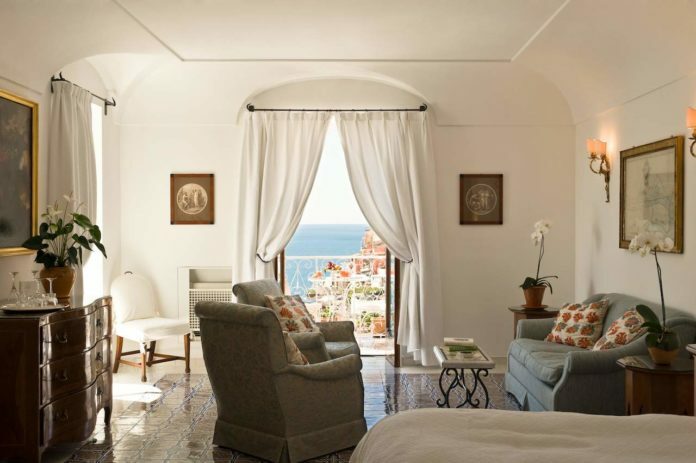 The rooms and suites retain the personal touches of a private residence and offer dramatic views over the bay of Positano. Standing 70 metres above the sea, the rooms are an unbeatable oasis of peace and silence, with breathtaking views. Prices start from £325 per night including breakfast, based on two people sharing. 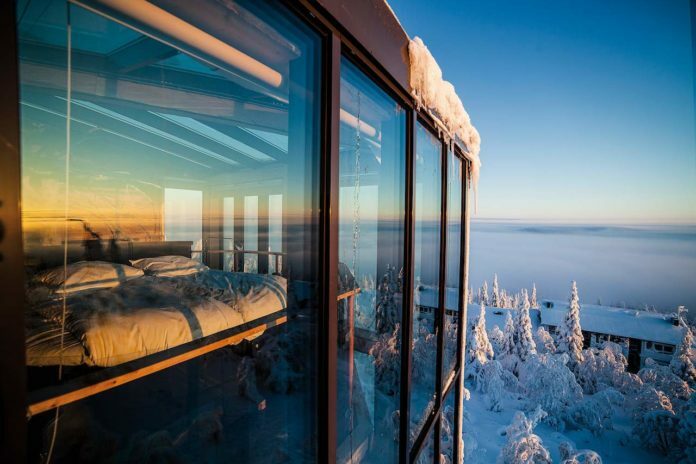 Hotel Iso Syöte‘s Eagles View Suite, with its spectacular floor to ceiling glass windows, offers guests panoramic views of unspoilt nature, vast forests and the beautiful lakes of Finnish Lapland. The glass roof allows guests to admire the long summer nights and secluded night sky. In winter, guests can see the spectacular Northern Lights. The Eagles Suite is divided into two floors, with a tree growing up through the centre of the property and the bedroom on the top floor. Prices start from £312 per night based on two people sharing.